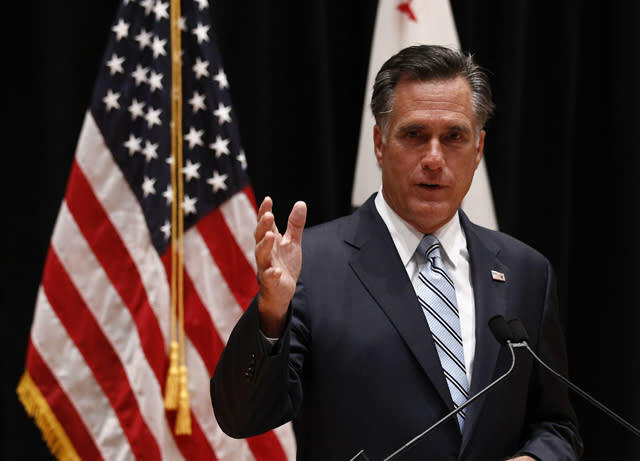 COSTA MESA, Calif.—Mitt Romney stood by his comments captured on a hidden camera at a closed-door fundraiser earlier this year in which he called supporters of President Barack Obama "victims" and said they are reliant on government handouts. In a hastily arranged news conference Monday night, he called his words "off the cuff" and "not elegantly stated," but given several opportunities to back off the comments, he did not. Romney said he was merely talking about the "political process of drawing people into my own campaign." He described the incident as a "snippet of a question and answer session" and called on the full video to be released to show the question and his response in its full context. Asked if he was worried that he had offended the 47 percent of people he mentioned in the statement, Romney did not back off his remarks. "It's not elegantly stated, let me put it that way," Romney said. "I'm speaking off the cuff in response to a question, and I'm sure I can state it more clearly in a more effective way than I did in a setting like that and so I'm sure I'll point that out as time goes on." But, he added, "It's a message which I am going to carry and continue to carry." Still, Romney ignored a question about whether he really believes what he was saying. Asked if his words were reflective of his "core convictions," Romney simply walked away. Romney's remarks came hours after Mother Jones magazine posted a video shot from inside a fundraiser in Boca Raton, Fla., in May, which immediately went viral. Romney, who was headlining a fundraiser here, delayed his appearance to comment on the video to his traveling press corps in hopes of quelling the controversy over his remarks. Speaking from a conference room inside a performing arts center here, Romney walked to the podium wearing a smile and sounded intentionally upbeat as he read from notes. Asked what he meant by the word "victims," Romney cast his remarks as simply accentuating the differences between his campaign and Obama's. "My campaign is about helping people take more responsibility and becoming employed again, particularly those who don't have work," Romney said. "His whole campaign is based on getting people jobs again, putting people back to work. This is ultimately a question about direction for the country. Do you believe in a government-centered society that provides more and more benefits or do you believe instead in a free enterprise society where people are able to pursue their dreams?"